Designed by Beechcraft Corporation based on the highly successful model 35 Bonanza, the T-34A entered service in the U.S. Air Force in 1954 as its new primary trainer. This tandem seat trainer is world known for its ease of maintenance, honest flight characteristics and aerobatic flight capabilities. The Aerotrek T-34 Mentor once served with the United States Army Air Force, where it was based at Marana AFB in Arizona from 1954. In 1956 it was assigned to the Tinker AFB Aero Club and then the Wright Patterson AFB Aero Club in 1973. 1978 saw the aircraft sold into civilian hands where it flew as N10441, until imported into Australia in 2013 by Aerotrek. 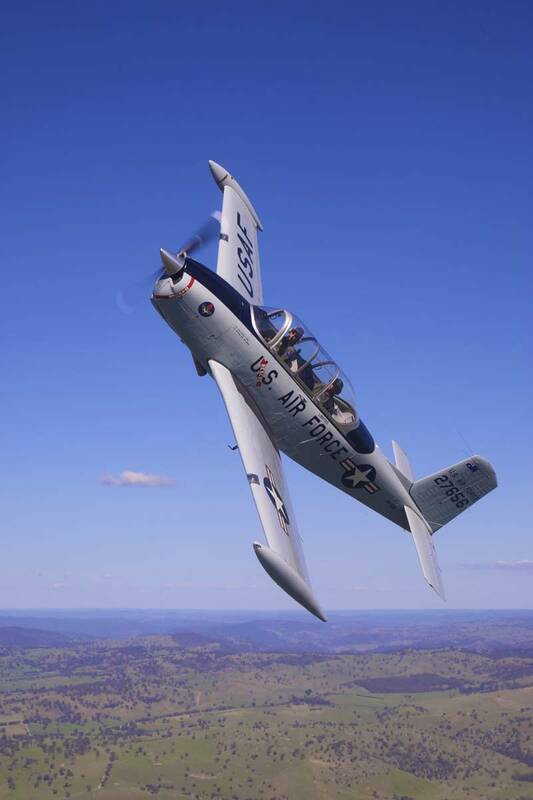 It is currently the only T-34 Mentor in Australia and you are in for a rare treat! The aircraft is an ex warbird and is maintained to a different standard to other GA aircraft. The passenger flies at own risk. The passenger is required to complete indemnity forms prior to flight. Passengers must read and comply with a pre-flight briefing, which is in printed form. Drop us a line to learn more and to book your flight.